Environment Designers are other-world creators. Their concepts enable their audience to delve into their imagined realm. What was so interesting to follow in the Ancient Civilizations Challenge was how drastically different the theme could be interpreted and approached to create a wide range of expressive and inspiring environments. 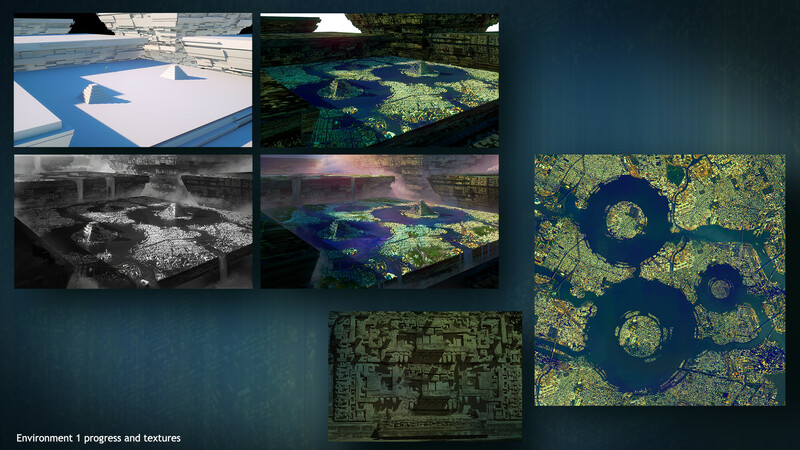 See all Environment Design submissions for the Ancient Civilizations Challenge here. For this challenge, participants had to design not one but two unique environments that fit within the theme of Ancient Civilizations: Lost & Found. The submission also had to include a callout sheet containing elements that make up the final rendered environment. 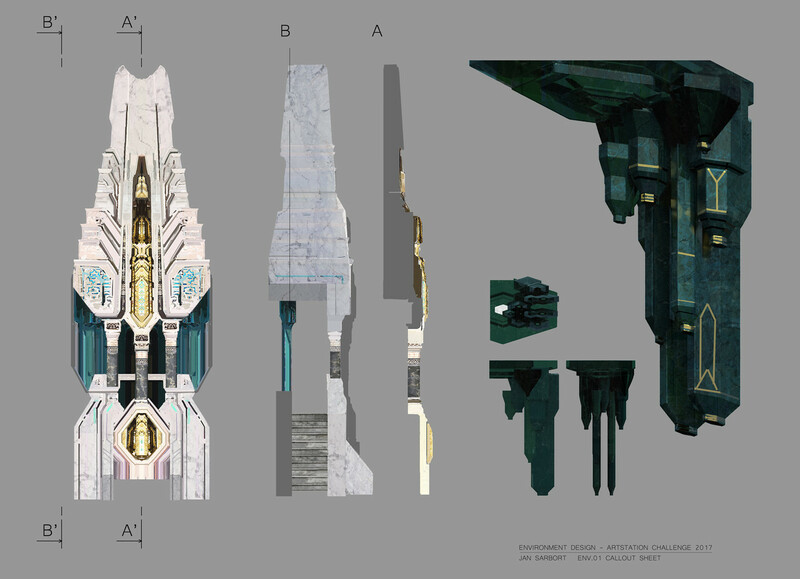 In a production environment, beautiful, fully-rendered environment concepts serve to sell the overall mood of the space so the call outs of those rendered environments needed to be able to serve as the blueprints for the art team to model specific elements, and for the purpose of the challenge, show your design process behind each location. 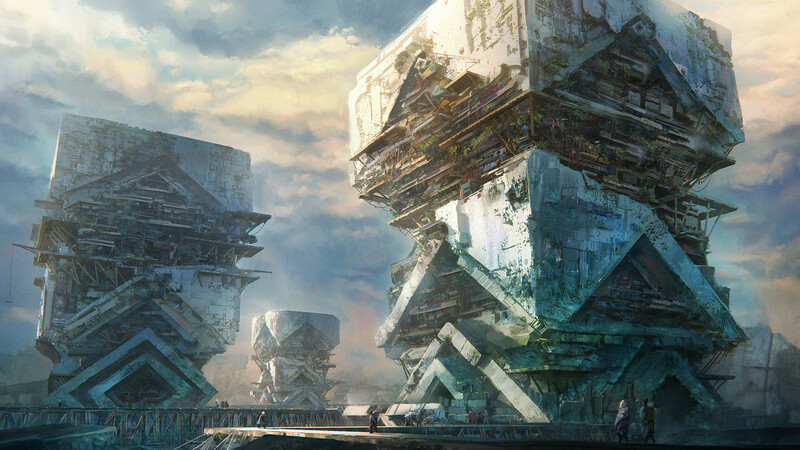 If you’re an aspiring environment designer or ArtStation challenger, take notes on the great advice from our challenge winners Leon Tukker, Ryan Moeck and Jan Sarbort. Find out about their ideas, process, future challenge tips and more! What is the most important factor to consider in creating a environment? Leon: I feel that it is very important that you convey the mood and the scale with your paintings. I struggle with this all the time. It’s not always as easy as putting a character into your painting. Especially with this painting since the scale is so large. You should always try to relate the audience to what they’re looking at. Ryan: It depends on the purpose and level of design. For instance, in visual development it needs to tell the story, which can be done through various things like architectural language, scale, and setting. But for a hero piece, I would actually say a strong focal point is the most important. For example, on this piece, I had defined architectural language, scale, and setting, but something was still not right with my image. I couldn’t figure out what it was. My composition was balanced, the depth values were correct and the lighting was solid, but it wasn’t working. I stepped away from it for a while, and went back and blurred the image, and it suddenly dawned on me: I had no strong focal point. I loved each building so much they were almost holding equal footing in the painting. I revised it to bring out the bottom left tower and pushed everything else into the background, and suddenly it worked. Jan: I think what’s crucial is what is behind it – the story, the particular project. The design language and mood should reflect it. The audience should feel what is that place about. For a painting piece itself it would be also composition. Leon: Maybe the scale of the image convinced looked interesting and fresh to the judges? I also tried to go for a somewhat unusual different color scheme with the pyramid one. 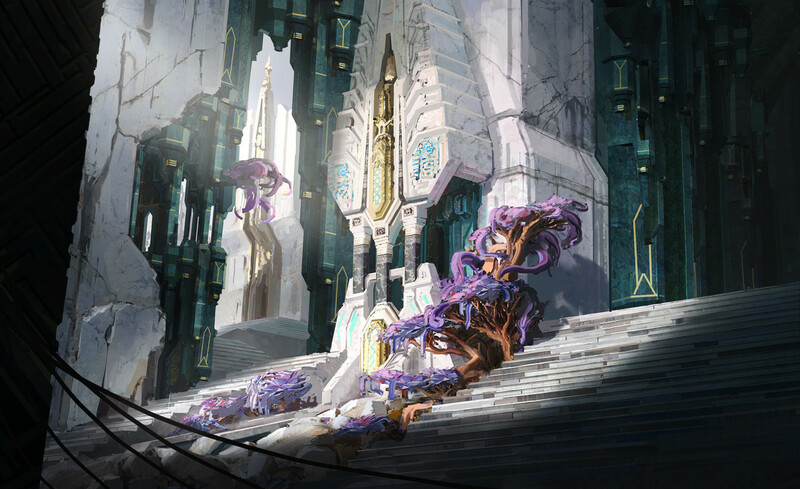 That one was a bit more risky compared to the other painting featuring the pillars. Ryan: I would guess it was probably the overall color palette. I stumbled upon some interesting teals and purples in the shadows that surprisingly went a long way. We’ve all seen hundreds and thousands of different environment designs through the years and the challenge increases as time goes on: How do you stand out? What can be done differently here that hasn’t been seen before? To do this, I try to find subtle things, like unique bounce lighting, that speak more to the viewer’s subconscious. Jan: Probably an interesting combination of design elements, alongside with the color scheme. Leon: The main motivation for me was to escape my comfort zone. I am very used to creating science fiction environments but this challenge really allowed me to escape that and go for a somewhat funky, fantasy approach. Ryan: I wanted to see how I would do in a worldwide event with participants from all over the globe with a blue sky creative brief and total artistic freedom. Jan: I wanted to force myself to practice a little more and perhaps learn something. Leon: My goals were to make one super large scale painting and one painting more close up and personal. For the painting with the pyramids I used displacement maps to get the main geometry for the city. I achieved that by spending some time in photoshop to create a detailed texture. Since the camera is so far away you don’t really see the irregularities of the geometry. I also tried to hide that by painting over it with the mixer brush in photoshop. The pillar painting was more straightforward with everything modeled in cinema 4D and painted over after in Photoshop. Ryan: I began thinking about ancient civilizations and kind of stories could live there. I started putting together a rough story outline in my head around a concealed people called Ifurians deep within the remotest parts of the world, and began sketching. As I sketched, more ideas came together and fed the story about this event that fractured this people into two sides, which then fueled more sketching and painting. It was really a cyclical process. I sketched dozens of thumbnails and roughs exploring different questions like how remote were they? Were they deep in the earth? On mountaintops? In the ocean? How technologically advanced were they? What did their architecture look like and what was its function? And, most importantly, what makes this story unique, and how can I reflect that in a single hero image? Jan: I didn’t have any particular strategy, but I did a lot of research before I started an actual work. I thought out some combinations of elements in advance, and then did some mood/color sketches. Also when picking from design variants, I did go for the most unusual ones. Leon: I was following most of the submissions. Especially the submissions by my close friends as we were constantly giving each other feedback. I also loved Ryan Moeck’s submission. His colors were so otherworldly and unique! I also closely followed Desmond Man‘s submission since he took my painting as a base for his amazing real time environment. Ryan: I was following quite a few others and was really impressed by so many. 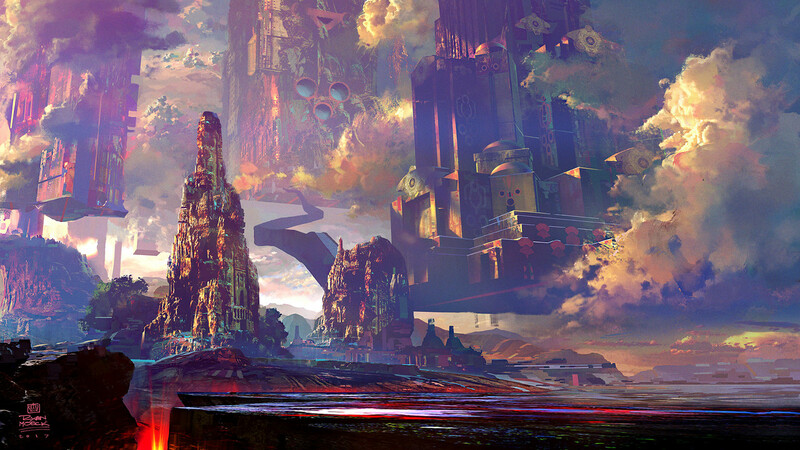 Leon Tukker and Jan Sarbort did a beautiful job, obviously. I was watching theirs and commenting the entire time. A couple others that stood out to me were Andrew Hodgson‘s entry that had a ton of detail and pulled off a monochromatic scheme really well, and Hector Mateo Pino‘s entry that had a fantastic narrative and beautiful, complex rendering. I also thought Jeff Bartzis‘ entry was super strong, and who knows what would have happened if he had been able to finish his out. They all did a fantastic job, along with so many others. 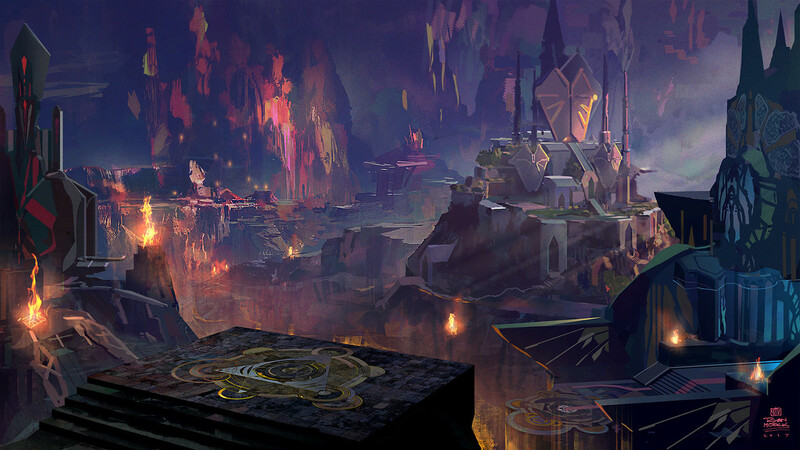 Jan: think my favorite environment design submission was Ryan Moeck’s work. Especially his first piece is really engaging. A quite special surreal design, with a courageous color palette. What was the hardest part of the Environment Design challenge? Leon: The hardest part for me was the fact that I was afraid to over-render the image. I didn’t really know when to call the paintings done but I didn’t want to ruin them by over detailing them. It’s always hard to find a good balance between the hard edges of a 3D model and the softer brushstrokes you achieve with painting. Ryan: The hardest part was finding time to work on it around my full-time job and family commitments. In fact, I uploaded my half-complete entry with about 30 seconds to spare, and spent another two weeks finishing the second image and all of my callouts, which is what I actually show in my portfolio today. Leon: I gained a couple of new friends which is always amazing. Also, this challenge allowed me to go outside of the sci-fi comfort zone. It also allowed me to push my images a bit more instead of having to rush them because of tight deadlines! Ryan: I gained valuable insights into a ton of different approaches to the same problem by extremely talented designers across the world. I was amazed at how some would flesh out an entire narrative before even beginning, and how others would focus on small details at first and then go big picture. 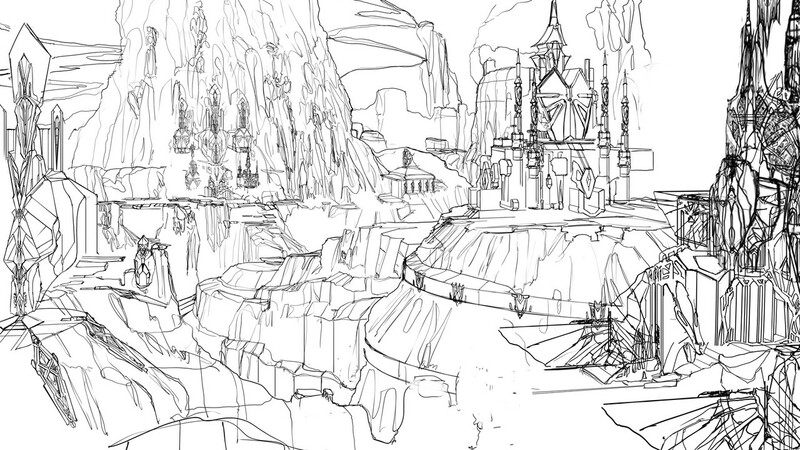 Others jumped right into 3D, and worked out full layouts, which is something I’d like to do more of myself. Jan: Fun, some experience, some exposure and a few new friends? Leon: The best advice I could give is: Have fun! Don’t be discouraged by other people’s submissions! They’re going through the same struggles as you are! Don’t be afraid to ask other people for feedback. It’s a small industry and almost everyone is prepared to help you if you ask. Ryan: Get your callouts done early! Don’t wait! Jan: A classic one – Think outside the box! See more Ancient Civlizations Environment Design challenge entries here.